We won't mind some of that! Hah! LOL live mouse inside. Have a terrific Tuesday. And there would be mousie 'sprinkles' too! Pee Ess - Mommy said "gag"! MOl! Haha - yum! At least the mouse won't get hungry inside the box. 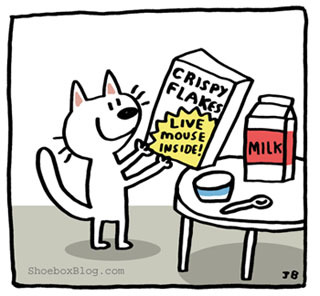 Love this cartoon - I've added that cereal to my Mom's grocery list....I hope they carry that in our store! Meanwhile, on another note, Mom got her new 'puter yesterday and we can now VISIT and Comment on your blog. I'm so happy! I've missed being able to visit you all! hasta la vista, little crispy flakes. Yep! That has happened to Mommy A zillion years ago! She opened a box and started to pour some cereal in a bowl for my human brother and a mouse fell in the bowl!!!! Mommy is laughing so hard she is snorting right now! OMC, somebody needs to REALLY invent that! Cute! Your cartoons are always cute. If mouse tastes anything like my hamsters smell, kitty is in for a delicious treat. WHERE CAN THE HUMAN BUY THEM???! !